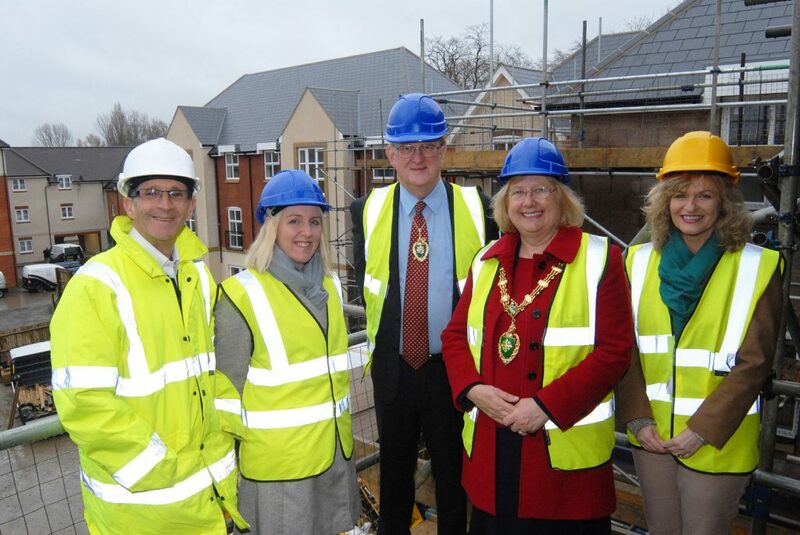 Mayor of Abingdon and Leader of the Council join Bridge House to celebrate key point in development Bridge House, the state of the art new care development under construction in the heart of Abingdon, took an important step closer to completion today. The Mayor of Abingdon and the Leader of the Council joined the development team to toast the buildings ‘topping out’, as work on the roof was completed. Mayor Monica Lovatt and her husband Sandy, the Leader of the Council, joined Bridge House’s Managing Director Nicola Coveney and newly appointed Home Manager Maggie Griffith to celebrate this important milestone. Bridge House will be complemented by The Riverly Club, a members club for older people, providing a range of facilities including a Spa, Wellbeing room, Cinema, Café, Bar and Library. Residents of Bridge House can access The Riverly Club facilities and membership will also be available to older people in Abingdon seeking a special place to relax and enjoy a range of events and occasions throughout the year. In addition to delivering excellent care and social facilities, Bridge House and The Riverly Club will provide around 80 full and part-time jobs for local people, and will make a significant contribution to the town’s economy.